It’s been a while since Nikola Tesla — one of the greatest inventors mankind has ever known — claimed to demonstrate wireless power transfer in 1891. Mr. Tesla even claimed to drive an electric car on wireless power in the 1930s, recording a top speed of 90 miles per hour in his lab notebooks — a feat that would put it on par with the best gasoline engines of the time. In his notebooks he claimed to have achieved 95 percent efficiency in transmitting the power over radio frequencies — an incredible accomplishment, if true. But what would drive conspiracy theorists for decades to lose sleep was what happened at Wardenclyffe tower. Mr. Tesla had scored a believer in banker JP Morgan, but in 1917 the banker (the father of today’s JPMorgan Chase & Comp.) inexplicably withdrew support without disclosing why. 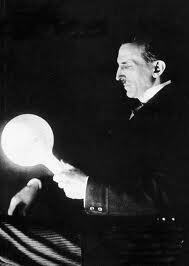 The prevalent line of thinking since was that Mr. Tesla had failed in his bold vision of wireless power transformation. Or maybe Mr. Morgan discovered the tower’s true purpose — that Mr. Tesla hoped to use it to transfer power around the world — and was angered by being lured by more modest promises. Mr. Tesla’s efforts on wireless power quietly died as he turned to other projects. And as almost every occasional scientist who investigated these stories throughout the 1960s, 70s, and 80s failed to replicate his results; many simply called them hogwash. But over the last five years something inexplicable has happened. Wireless power research has reinvented many of the technologies that Mr. Tesla claimed to have built. The crudest examples are currently the only ones available to the consumer — induced power between planar coils. This technology is currently being tested at the University of Utah as a means of charging electric vehicles (including electric buses). 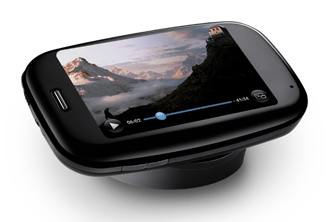 This technology has been used to charge mobile devices under the Qi standard, which appears in devices by Microsoft Corp.’s (MSFT) Nokia Devices and the now-defunct Palm brandwhich sold a wireless charging device dubbed “The Palm Touchstone” [see this teardown for more info]. 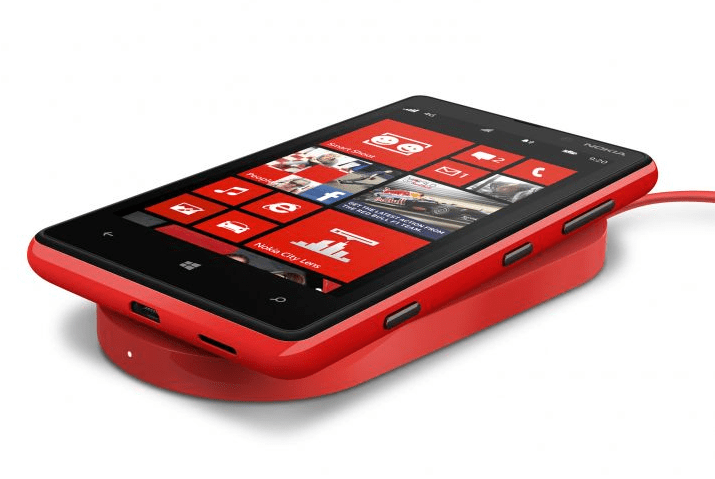 Nokia and various Android OEMs have already standardized this technology. The Qi Wireless Power Consortium is growing fast, but has a major limitation — it can only charge devices within 4 centimeters of a charger plate, which can be a standalone unit (see above) or built into a table. 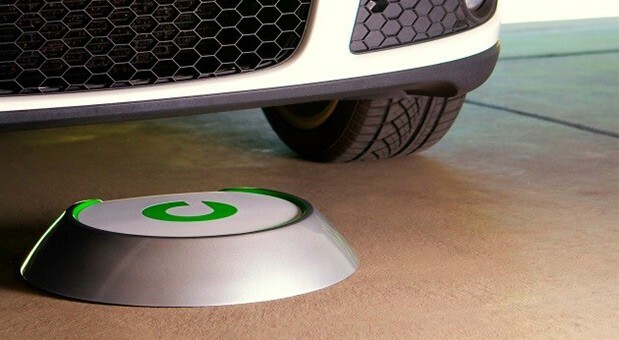 Evatran Group Inc. has shown that by using resonant tuning the range of inductive charging can be increased from centimeters (as with Qi) to feet. It’s paired with German automotive giant Robert Bosch GmBH to sell wireless charging base-stations under the “Plugless Power” brand. Plugless Power claims 90 percent efficiency — approaching the efficiency claimed by Nikola Tesla over a century later. The U.S. Department of Defense and General Motors Comp. (GM) are deploying smoke detectors and clocks that don’t need batteries, but are powered by radio waves, according to Fast Company. Ironically a single man whose home nation lies not far from Mr. Tesla’s home nation of Serbia spearheads these efforts. When Croatian native Marin Soljacic began his exploration of wireless power at the Massachusetts Institute of Technology (MIT) many scoffed at the idea. But soon they weren’t laughing when he proved his ideas in peer-reviewed literature and founded a company WiTricity. 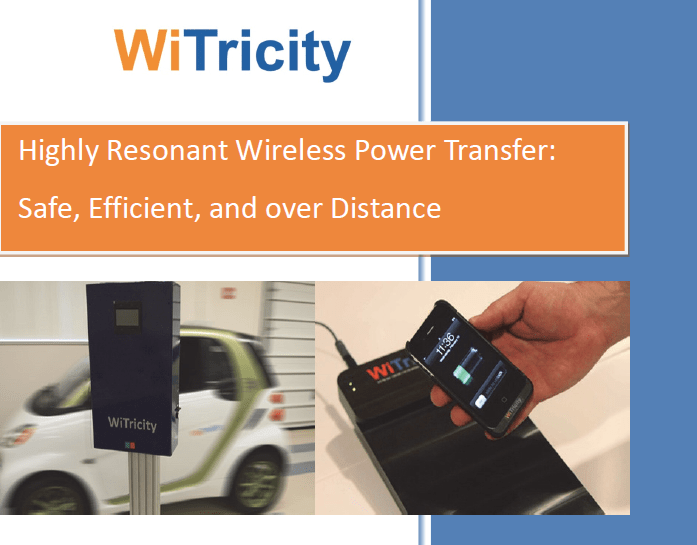 WiTricity — whose technology GM and the DOD are likely tapping — uses radio wave-driven induction (similar to the methods Tesla used) to drive power over hundreds of feet (or more via resonant boosting stations). Like Mr. Tesla’s work, these fields have shown remarkable efficiencies — 98 percent or greater per stage and 90 percent or better over multiple stages. But so far WiTricity — who is looking for building-scale wireless power deployments aided by repeating resonators that boost the power — has yet to transmit power over the air. But wait, you say, didn’t Tesla transmit wireless power over miles, not feet? Indeed, but here recent technology is breaking through barriers installed by years of disappointments. This new research is showing that power transfer via microwaves and radio waves is not only possible — but can be extremely efficient if properly tuned. Duke University Electrical Engineering Professor Steven A. Cummer and his studentsAlexander (“Alex”) Katko (a Ph.D. candidate) and Allen Hawkes (an undergraduate) havepublished a new paper in the peer-reviewed journal Applied Physics Letters detailing a device that can harvest power from microwave signals. It’s possible to use this design for a lot of different frequencies and types of energy, including vibration and sound energy harvesting. Until now, a lot of work with metamaterials has been theoretical. We are showing that with a little work, these materials can be useful for consumer applications.The properties of metamaterials allow for design flexibility not possible with ordinary devices like antennas. When traditional antennas are close to each other in space they talk to each other and interfere with each other’s operation. The design process used to create our metamaterial array takes these effects into account, allowing the cells to work together. Microwaves — electromagnetic waves in the 1 Megahertz (MHz) (10^6 Hz) to 1 GHz (10^9 Hz) range — are most commonly used to cook food (in microwaves that use the 915 MHz band) or carry out radar signaling. Today perhaps the most common use of microwaves is in wireless data transmission — for example the 802.11 family of wireless transmission technologies transfers data on the 2.4 and 5 GHz bands (in the microwave range). These waves have wavelengths in the meter to millimeter range. After visible light and the infrared spectrum, they’re the next longest wavelength, followed by radio waves — the frequencies used by Mr. Tesla purportedly used. The Duke study uses so-called “metamaterials” — materials that have structures smaller than a target wavelength and are used to create unusual behavior in waves of a certain frequency. You may recall that metamaterials are being investigated as a “cloaking mechanism”. As visible light is in the 390 to 750 nm range, the resonant metamaterials used for optical cloaking (or laser focusing) generally have to measure 100 nm or below. 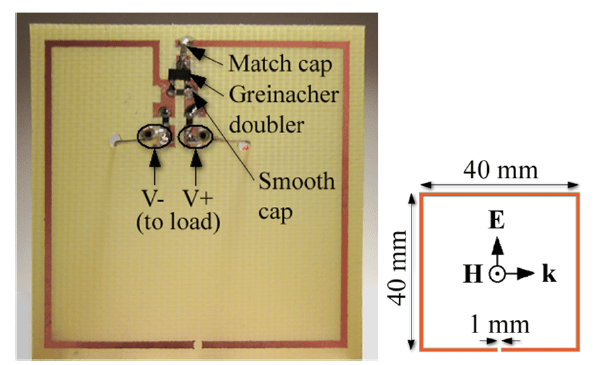 By contrast, the metamaterial for this study is much larger as the target frequency is much larger. The Duke device measures 40 millimeters x 40 millimeters and acts somewhat like an antenna using a split ring resonator (SRR). Clearly this is much larger than optical metamaterials. This resonator is designed to harvest a 900 MHz (0.33 m wavelength) signal. The resonator is built with simple materials — copper conductor printed on a fiberglass circuit board, with attached electronic components. The finished resonator captures power that’s directed into it by a large metal wave-guide. The maximum theoretical efficiency of the captured incident power is 78 percent, but a resonator single cell was only able to harvest 14.2 percent of the incident power. 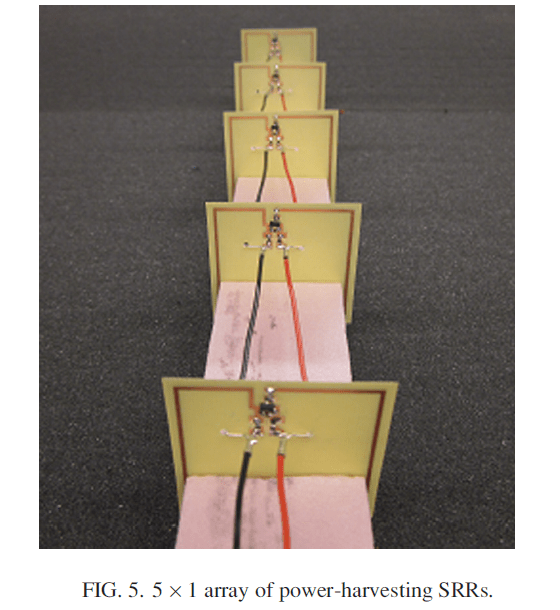 By coupling five resonators together inside the wave guide, 36.8 percent efficiencies were reached — roughly half of the maximum theoretical value. At roughly 17 dBm of input power, a 5 volt output DC open circuit voltage was obtained. That’s enough to drive many electronic devices. This is better than most commercial solar cells which generally have around a 20 percent efficiency, at best. 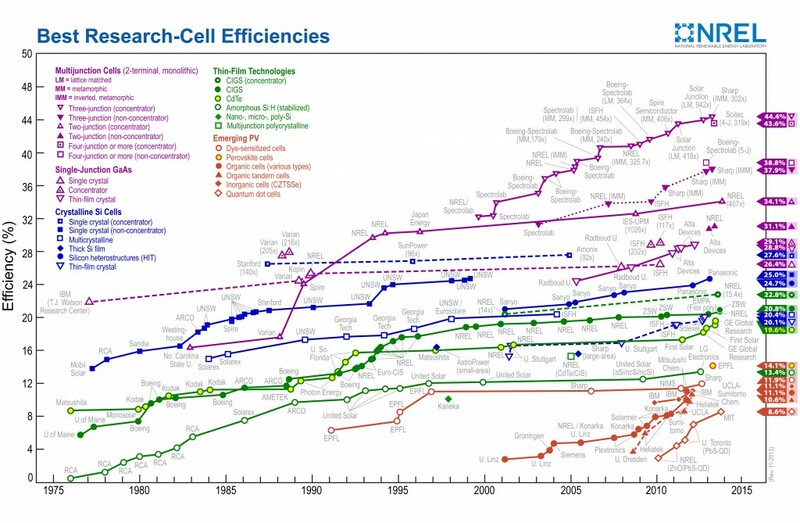 To date only multi-junction solar cells have produced >30 percent incident harvest efficiency. We were aiming for the highest energy efficiency we could achieve. We had been getting energy efficiency around 6 to 10 percent, but with this design we were able to dramatically improve energy conversion to 37 percent, which is comparable to what is achieved in solar cells. So just how much promise does this hold for power transmission? Read on for some basic analysis. While that sounds great, the commercialization prospects for now are a bit weaker than it seems on the surface. 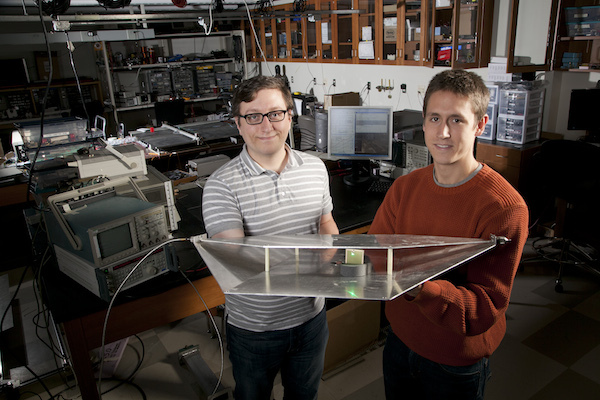 The first issue is size — the array was attached to a metal wave guide is the size of a restaurant serving tray (so not exactly portable). The second issue is signal strength. A typical router produces around 22 dBm of output power. Power generally dissipates quickly, and by the time it gets to you it’s at -70 to -90 dBm [source]. So unless you’re charging millivolt devices, power from a router won’t cut it; you’ll likely need a dedicated power base station. 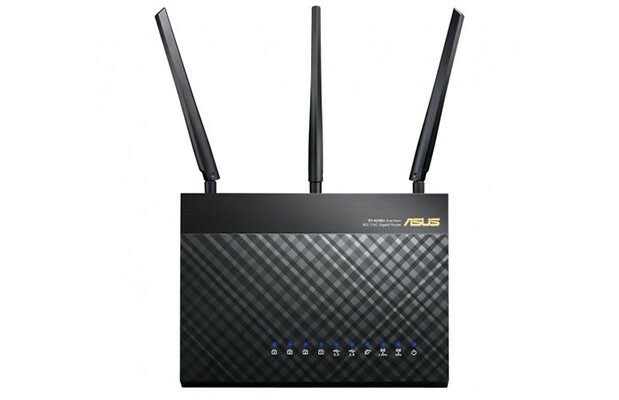 Wireless routers wouldn’t produce enough power for the antenna array ot make use of. That said there’s tremendous potential for improvement. Tesla’s work — if accurate — suggests that new wave guide designs and different frequnecies may produce much better results. Chaining together even more cells seems a promising approach as well, as increasing the cell count 5-fold increased the power harvest 2.5-fold. Tesla’s notebooks suggest that his Wardenclyffe tower was capable of producing roughly a 100 Megavolt (MV) (100 million volt = 1e8 volts), roughly 1 KA (kiloamp = 1,000 ampere = 1e3 A) signal. That would hint that its peak power output might be 1e11 watts (100 Gigawatts (GW)). Tesla could have harvest power in the radio range using a relatively large “metamaterial” — possibly meters per side for a signal in the KHz range. It’s unclear whether he did this, but if that could be proven it would demonstrate that he might have been the first inventor to understand and use metamaterials, as they relate to EMF. But returning to the claims about the Wardenclyffe tower’s transmission power, it seems likely they are erroneous or referring to very brief bursts of signal strength. In terms of a well-document modern comparison, the VLF Transmitter Cutter is often cited as the world’s most powerful radio tower and it’s only capable of producing 1.8 MW (between 92 and 93 dBm) sustained signals. 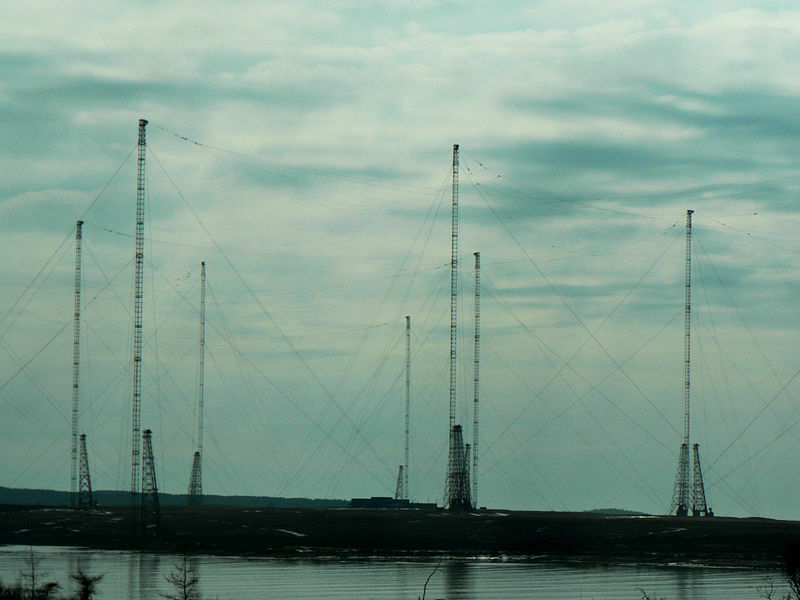 The tower operats at 24.0 kHz, thus it has a rough free space wavelength of 12.5 kilometers. In other words if you can develop a wave-guide for 12.5 kHz signals and point it in the direction of the U.S. Navy’s radio tower, by my calculations (correct me if I’m wrong), you could get enough signal strength to produce a 10+ volt charging open circuit voltage, based on the team’s findings… sort of. The sort of, comes from the fact that once you’d intercepted the signal (effectively sucking its power out of the air) you’d presumably be blocking any other object in your antenna’s direct path from receiving power. The easy way to understand this is imagine if dozens of receivers were situated directly around the tower. 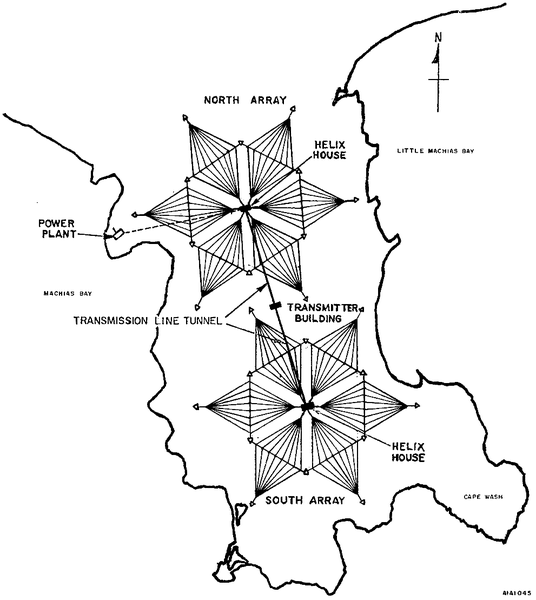 Even if they had 100 percent conversion efficiency (impossible) and intercepted all of the signal (also impossible) they would only harvest 1.8 MW of power. As the signal dissipates and as the conversion efficiency of the receiver drops, you’ll only be able to harvest some fraction of this power — likely kilowatts or less. In other words, you’d probably need dozens, if not hundreds of similar antennas across the country sucking down massive amounts of power to produce a wireless power transmission scheme capable of power household electronics. And such a scheme would be very wasteful — as free space power losses build rapidly with distance. That said, if many such devices were someday deployed (say within every kilometer of an urban location), the convenience might outweigh the power losses in urban areas, at least. More likely though, the system could be installed in large buildings to produce power at between 100 meters from broadcast stations or less. That would minimize the free space losses, giving a receiver a fighting chance if the waveguide is optimized. What does this mean for Nikola Tesla’s legacy? While it’s impossible to prove that his wireless power claims were true, it does offer evidence they might have been feasible on some scale. And for Tesla fans, that adds yet another justification for admiration and conspiracy theorizing alike. Duke University is bullshitting you! The device has an efficiency “similar to that of modern solar panels”? This efficiency is for almost 1W input power!!! The efficiency drops rapidly with available power.